Ready for some clever political satire set to your favoriate tunes? For more than 130 years, a great Washington tradition known as the Gridiron Show has skewered Presidents and congressional leaders, political candidates and journalists. The Gridiron Club and Foundation first regales official Washington at a white-tie dinner on Saturday night in March with satire and songs. 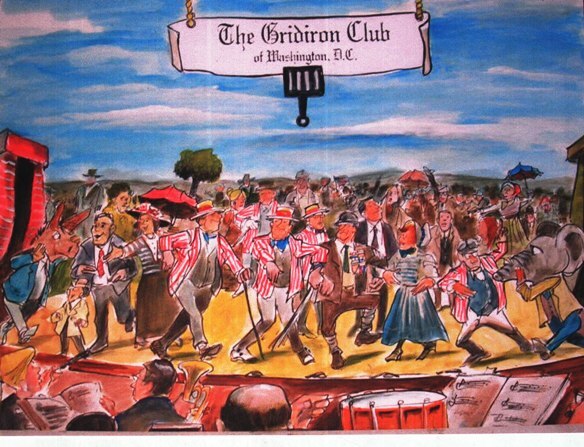 The next day, the club puts on another performance – known as the Gridiron Sunday Reprise - for associations, alumni groups, friends and family. Join fellow Harvard alumni at this event on Sunday, March 3, 2019. The 2019 Sunday Reprise will be held in the ballroom of the Renaissance Washington, DC Hotel, 999 Ninth Street NW. The reception, which includes beer, wine, soft drinks and munchies, begins at 2 p.m. and the show starts at 3 p.m. and ends by 5 p.m. Dress is business casual. The program features Gridiron members — including well-known faces that might include Jonathan Karl of ABC News, Andrea Mitchell and Chuck Todd of NBC, Judy Woodruff of PBS and Bret Baier of Fox News — performing hilarious songs and skits in costume. Syndicated columnist Mark Shields relays highlights of the speeches that were delivered the night before, which typically include remarks by the President and a leading Democrat and leading Republican. Running the musical performance is the director of the United States Marine Band, Lt. Col. Jason Fettig, the Club's musical director. Tickets will be distributed in the hotel lobby beginning at 1:45 pm. Those not retrieved by 2:45 pm will be left at Will Call.